A song sheet with the words to the song "Yankee Doodle"
How did a song help the Colonial soldiers win the Revolutionary War? 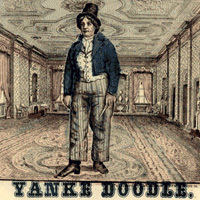 Connecticut's state song is "Yankee Doodle." This popular song has an unusual history. The words were apparently written by an Englishman during the French and Indian War in 1755. Originally, the tune made fun of the poorly dressed and ill-equipped New England soldiers. During the Revolutionary War with England, however, Americans slightly rewrote the words to make fun of the British soldiers. The song boosted the soldiers' morale (pronounced "more-al"; it refers to a person's enthusiasm or mood) and was a source of pride for the American soldiers. Good morale is important during a war so that people don't get discouraged and give up. Anything that could be done to boost morale was a good idea.